When BYUtv creative development supervisor Jared N. Shores (BS ’10) attended a 2011 show of BYU’s sketch comedy troupe, Divine Comedy, his expectations were low. Veteran student performer Matthew R. Meese (BS ’09) had told him he really needed to check out the cast. Shores anticipated a few cheap laughs in a lackluster student show but agreed to attend. What he discovered was an uproarious performance that, through a fledgling YouTube site, was beginning to get attention far beyond campus. Shores and Meese soon began examining how they might create a half-hour BYUtv comedy program that would appeal to college kids as well as teens and tweens and their parents. What they came up with was Studio C, a comedy show featuring 10 BYU grads in three- to five-minute skits ranging from silly to literary. 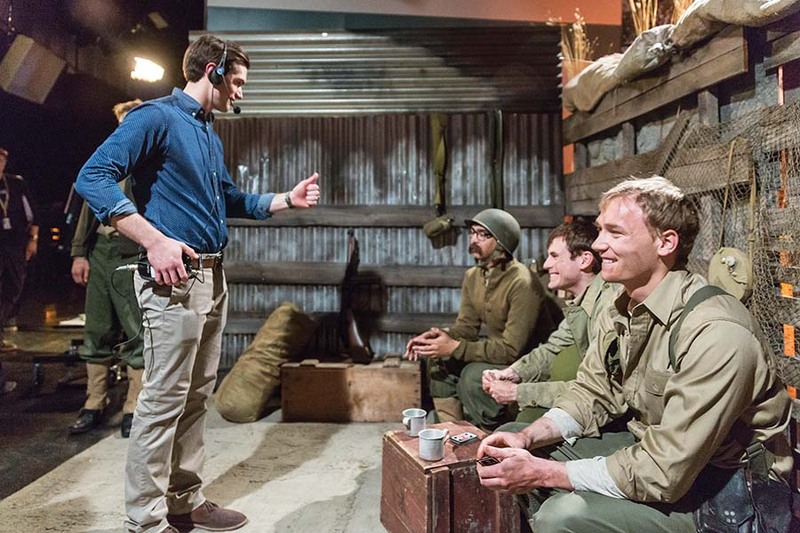 Jared Shores directs a Studio C skit featuring, from left to right, Jeremy Warner, Matt Meese, and Jason Gray. Photo by Jaren Wilkey. With Shores producing and directing the show, Studio C got laughs from its first sketch in 2012. Now 500 skits later, it has garnered a massive following on TV and online, where the show has more than 600,000 YouTube subscribers. “I could not have predicted this ever-growing popularity when Matt approached me,” says Shores. Studio C’s biggest online victory came via the face of Scott Sterling, a hapless soccer goalie (played by Meese) who repeatedly saves penalty kicks with his battered face. That 2014 video delighted more than 100 million viewers (35 million on YouTube alone). At the same time, Studio C debuted three Hunger Games parodies and drew millions more viewers. Since then, some three dozen other videos have passed the coveted million-views mark. Shores says the formula for Studio C’s success is funny, creative, and relevant content that avoids the crassness and obscenity that characterize much of contemporary comedy. He credits his BYU degree in economics with helping him understand and analyze audiences.